Dive feet first into the snowfields of all your glacier and mountain climbs with La Sportiva's sturdy, durable Baruntse double boots that keep you warm when you travel into the mountains. The insulating outer boot provides tough protection and searing warmth without costing too much weight while the Cordura coated inner boot uses high-density foam to add more heat to your hike. 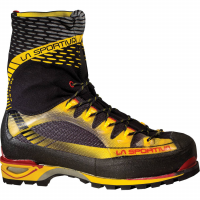 Developed in collaboration with world-renowned Italian alpinist Simone Moro, the La Sportiva G2 SM is a technical, warm, extremely lightweight double boot for mountaineering. 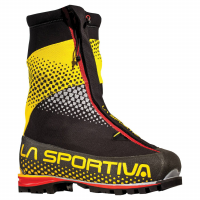 The La Sportiva Trango Ice Cube GTX is a lightweight, insulated, waterproof technical boot for all alpine conditions. Made for several terrains, the Glacier Boot from La Sportiva is designed with newmatic crampon compatibility and will certainly propel you over all sorts of rocky trails on your way to the snow and ice.